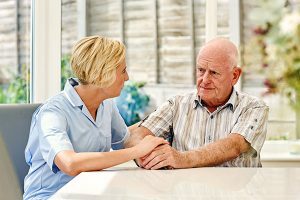 It’s a struggle that arises for a lot of families: aging parents adamantly would like to age in place at home, while their loved ones worry about their health and safety. The struggle between senior safety vs. independence is real, and there’s an argument to be made from both sides. Seniors, particularly those who live alone, face a variety of risks: falls that could bring about significant injury, difficulty in maintaining the standard of living to which they’ve become accustomed as aging progresses, even a vulnerability to scam artists. Yet independence is key to self-worth, no matter the age. Striking a balance that suits the needs of both sides is often difficult, but there are important factors to bear in mind that can help. Let go of ageism. While there is undoubtedly legitimacy to fears over well-being for aging parents at home, especially if they live alone, the other side of the picture is our understanding of aging. Pioneer Network President/CEO Penny Cook explains, “Our negative perception helps marginalize older adults. They become ‘less than’ because that helps us cope and then we take on the parental model.” A shift in this reasoning allows us to give the respect to seniors that they so rightly deserve, and to know how valuable it can be for them to continue to be as independent as possible during the course of aging. Communicating is essential. As with every conflict, calm, logical discussions are probably the best weapon in diffusing difficult situations and coming to an answer that really works for the entire family. Sit down with your senior loved one and talk about your fears, but prepare yourself to listen with an open mind to his or her opinions and views. Understand that an answer most likely is not reached in a single discussion; use a preliminary conversation as a launching point, and agree to revisit the matter regularly to reassess. Just remember, understand that there’s a viable alternative: the professional in-home care services of Midnight Sun Home Care, the most trusted place to turn when looking for a personal care assistant in Anchorage, Alaska. We are able to assist in a number of ways to maximize safety, offering family members peace of mind, while empowering seniors to maintain independence, making their own choices and decisions within the comfort and familiarity of home. Contact us at (907) 677-7890 for an in-home assessment or to learn more about how we can match you to the best personal care assist for you in Anchorage, Alaska.